Herbie the Mousebot is a 9-volt battery-powered robot that loves to chase flash light beams. 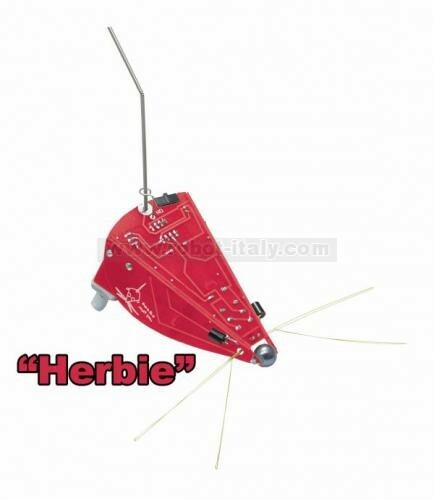 Originally invented by Randy Sargent, Herbie was built from spare parts as an entry for a robot competition. Herbie is such an elegant, clever design using very few parts, it's been featured in as a construction project in "Junkbot, Bugbots, and Bots on Wheels", "Absolute Beginner's Guide to Robots" and "MAKE" Magazine. We've enhanced Herbie a bit with functional whisker and tail sensors, so it doesn't get stuck in corners while it chases around. Herbie the Mousebot is a 9-volt battery-powered robot that loves to chase flash light beams. 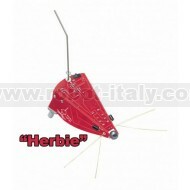 If there are several Herbies in the same area, they can be configured to chase each other! These little robots are so quick, you have to run to keep up to them!